http://www.JewishWorldReview.com | If Wisconsin governor Scott Walker were getting a dollar for every protester, politician, and pundit accusing him of union-busting, attacking public-sector employees, or waging a war on working people -- to say nothing of those likening him to Hosni Mubarak and Adolf Hitler -- it wouldn't be long before he could personally close his state's $137 million budget shortfall. To angry protesters occupying the Capitol building in Madison, it may seem clear that Walker's bill restricting the scope of collective bargaining for government employees is "an assault on unions," as President Obama called it, and no doubt many of them would agree with the AFL-CIO that "nothing less than democracy, fundamental rights, and freedom are at stake" in the fight over public-sector bargaining. But they aren't at stake. There no "fundamental right" to collective bargaining in government jobs. Indeed, labor leaders themselves used to say so. Arnold Zander, the Wisconsin union organizer who became the first president of the American Federation of State, County and Municipal Employees, wrote in 1940 that AFSCME saw "less value in the use of contracts and agreements in public service than . . . in private employment." Instead of collective bargaining, he explained, "our local unions find promotion and adoption of civil service legislation . . . the more effective way" to serve the interests of government employees. As late as the 1950s, AFSCME considered collective bargaining in the public sector desirable but not essential, and viewed strong civil service laws as the best protection for government workers. In December 1955, in a New York Times Magazine essay on "Labor's Future," no less a union icon than AFL-CIO president George Meany wrote: "The main function of American trade unions is collective bargaining. It is impossible to bargain collectively with the government." Obviously, Big Labor's outlook later changed. Dozens of states -- starting with Wisconsin in 1959 -- passed laws that authorized collective bargaining in the public sector, and public-sector unionism skyrocketed in the decades that followed. The Bureau of Labor Statistics reported in January that while union membership has dwindled to just 6.9 percent of the private-sector workforce, among public employees it has grown to more than 36 percent. 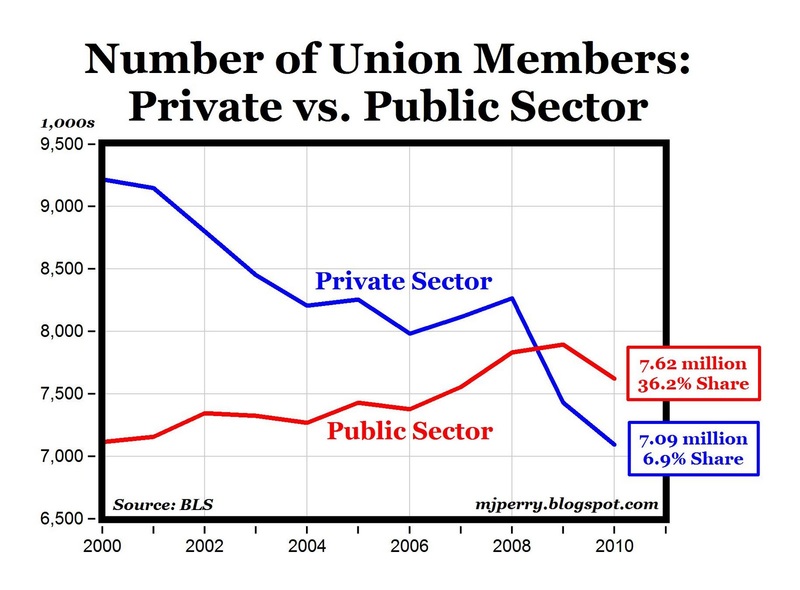 Today most union members work for government. With public-employee dues swelling union coffers by hundreds of millions of dollars annually, it's no surprise that organized-labor and its allies now embrace collective-bargaining in the public sector as a "fundamental right" that only a union-busting tyrant would threaten. Yet even today, public-employee collective bargaining is far from universal. According to a General Accounting Office summary, in only about half the states are unions allowed to negotiate labor contracts for most public workers. The other states either limit bargaining rights to specific government employees, such as teachers or firefighters, or ban public-sector collective bargaining outright. Among the states that don't allow public employees to bargain collectively are North Carolina, Texas, and Indiana; at last report, "democracy, fundamental rights, and freedom" were doing just fine in all of them. They'll do just fine in Wisconsin, too, if the governor's proposed reforms are passed. And then there are federal employees. Obama scolds Walker for trying to restrict collective bargaining by government employees to wages, yet the two million federal civilian (non-postal) workers Obama presides over can't even bargain over that much: With rare exceptions, the wages, hours, and benefits of federal employment have never been subject to union contracts. The president appears to be quite OK with that. Last November he unilaterally announced a two-year pay freeze for all federal civilian federal employees, informing them -- no negotiating -- that they were going to "make some sacrifices" adding up to $2 billion this fiscal year. Does this mean that federal employees are oppressed and underpaid? Hardly. Average federal wages far outstrip those in the private economy. When benefits are included, federal worker compensation averages $123,000 -- more than double the private-sector average of $61,000. Federal employees don't need collective bargaining over pay and pensions to be treated well, and the lack of bargaining rights has not busted federal-employee unions. As even labor leaders once acknowledged, it is civil-service rules, not collective bargaining rights, that safeguard public employees' interests in hiring, promotions, and discipline. Wisconsin could abolish public-sector collective-bargaining entirely, and its government workers would still be strongly protected from management abuse -- and as free as they are today to join unions able to advocate on their behalf. Wisconsin Republicans are targeting only the public unions' overweening political clout. They pose no danger to the welfare of public employees -- let alone to "democracy, fundamental rights, and freedom."